Poor Rich is the story of 14 year old Rich Cameron, an asthmatic, extremely allergic, brilliant nerd with a gay father and a homophobic step father who has only remained sane and functional because of therapy with a caring psychiatrist and the companionship of an irreverent parrot named U2. That is, until the day his allergies disappear. Poor Rich explores the moment in every adolescent's life when the preconceptions developed in childhood give way to the messier and harsher realities of adulthood. 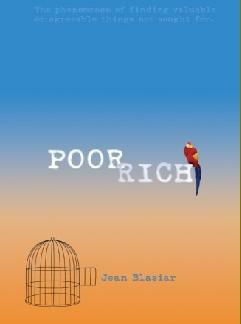 Told with compassion, biting wit, and containing a playful twist that takes the reader inside the mind of this unique, precocious youth, Poor Rich is one from the heart.